The Mississippians were organized as chiefdom level societies with upper, middle and lower classes. Agricultural products such as corn, beans, squash and pumpkins were given as tribute and stored as food staples in storehouses called barbacoas after the Spanish word for granary. The storehouses were located at principal towns and controlled by the chiefly elite. Mississippian artifacts include small triangular arrowheads, complicated stamped pottery vessels, polished stone axes, and shell jewelry. 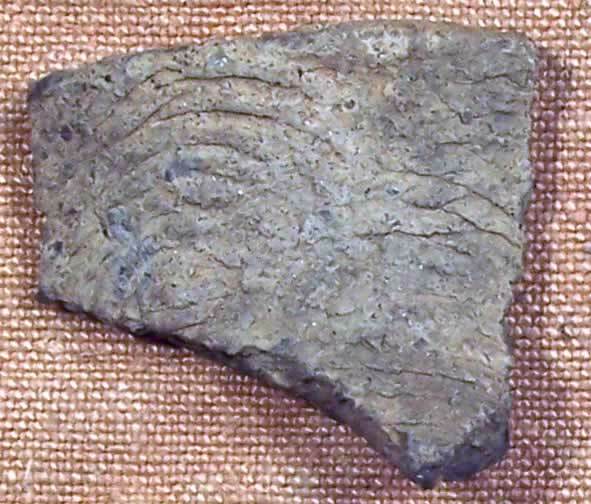 Although not well represented at the Kolb site, we have found some complicated stamped pottery that may be of the Mississippian period (900-1600 AD). This period is represented in the Yadkin/Pee Dee drainage by one mound site Town Creek Indian mound in North Carolina. Culturally this focus is known to archaeologists as Pee Dee but is named for the river. Several sites are known within a few miles. Upriver from the Kolb site is a very dense site of the Early Mississippian period around 1200 AD. In addition, a detachment of the Hernando de Soto expedition visited a site known as Ilapi in May of 1540 AD perhaps located near Cheraw. An interesting idea is whether or not the Hanover folks who occupied the Kolb site were contemporaries of the Mississippian occupants of the Great Pee Dee River (see Woodland Period section). Long thought to be Middle/Late Woodland phenomena, recent carbon dates at the Kolb site and along the coast of SC and NC have produced dates later than previously recorded by archaeologists. Another question would be why didn’t Hanover folks buy into the new economy and lifeway of the Mississippians. Ongoing research will try to address these questions about the last prehistoric occupants of the Great Pee Dee River.